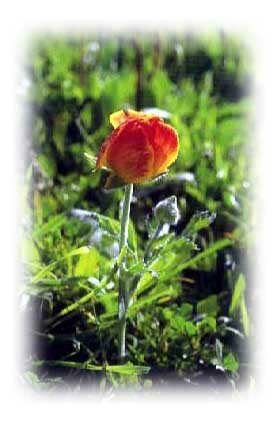 The Turban Buttercup is a perennial with sparingly branched stems up to 30 cm high, bearing bright flowers of many colour forms, from white to cream, yellow to orange, flame to scarlet, salmon pink or deep salmon pink, carmine and many amalgamations of these, or one colour petals of any number from 5-9. Stamens numerous, blackish violet, mahogany brown, or light tan. Fruiting heads, cylindirical. Leaves variable; root leaves either undivided or cut into wedge-shape segments; stem leaves more narrowly dissected. These beautiful flowers have many different colours, which makes spotting them exciting. For the complete novice, identifying them can can be confusing, because at first sight they are not unlike Crown Anemones -the quickest way to differentiate between them is to be sure that there are green sepals below the petals; there is no green bract wrapped around the stem under the flower. Rocky or grassy hillsides, pastures, roadsides, in ditches, foot-hills of the Kyrenia range on open scree below the north face; sea-level to 2,200 feet alt. Flowers from February to May. Very common in the eastern Mediterranean and eastwards to west Iran and north Iraq. Cyprus, Angus Hudson Ltd, London.